Permission should be acquired to take pictures of the object for official use. Lending agreement should be filled out and submitted to Iziko in order to relocate the object or include it in projects. This object was found at the cave named DK1 in Die Kelders (Western Cape), which is a rich archaeological site. The object appears to have been made by a person using a pointed carving tool to shape it; as there are thin cross-hatching marks across the object. The object, with its wider flat end tapering into a handle–like shape, claims the label of ‘spoon’ with ease. This is why it is such a popular guess. When the visitors were asked for an additional answer, more creative ideas came about, such as shoe horn, drum stick, spatula, foot scrubber, crowbar, weapon and many other things. 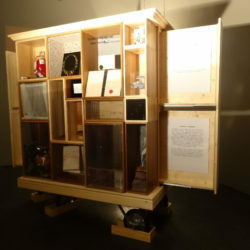 Of course, we also have to consider, that it is largely possible, that the object held no utilitarian purpose at all. Our attempts to assign it a purpose tell us more about how we think about objects today, than it does about the actual ‘spoon’. What if this bone was carved out of boredom, and then discarded when other priorities took precedence? What if this bone was a sentimental, artistic, or spiritual object that fulfilled no purpose as a tool, and was carried around as a type of amulet? All of these important questions can be seen in the inverted commas around the word ‘spoon’, as they attempt to make familiar an object that we might not fully understand yet. Although there are no sure answers, the ‘spoon’ is an exercise in imagination, challenging our views on what the past may have looked like. Taking its size and materiality into account, what do you think this object could be? Imagine the shape of a spoon. What is the first image that comes into your head? Is it an ordinary teaspoon? Or perhaps a big, wooden spoon? Whichever spoon you thought of, it was most likely not a 2 000-year-old carved bone ‘spoon’ found in a cave. This, however, was the object found by a team of archaeologists led by Dr Frank R. Schweitzer in 1969. They were excavating a cave site at Die Kelders, about 150 km south-east of Cape Town, South Africa, when they found an array of intriguing objects that indicated that humans had lived in the area some time ago. Among these items were ‘… bone awls, cylindrical bone points … tortoise-shell carapace bowls and potsherds’, as documented in Schweitzer’s (1970) preliminary report under the heading ‘Cultural Material’. Die Kelders is a particularly deep excavation site, made up of two caves: DK1 and DK2. Its depth, which stretches through multiple layers of sediment, means that it was likely a location to which generations of a nomadic people returned regularly. The site also revealed artefacts from both the Later Stone Age (LSA), dating roughly 1 500–2 000 years ago, and the Middle Stone Age (MSA), between 59 000 and 74 000 years ago. The ‘spoon’ falls into the former period. The bone ‘spoon’ is currently stored in the Iziko Archaeology Material Culture Collection, which is temporarily housed at the Slave Lodge in Cape Town. It is roughly 11 x 2.5 cm, with a flat, wider end that tapers into a thinner handle-like part. It is likely carved from a tibia or femur, which may be deduced from the bone’s curve and size. No tests have been done to confirm what animal the bone originates from, but it is assumed that the bone is from an antelope species that lived in the surrounding area – although other animal remains found in the area ‘include whale, porpoise, seal, antelopes, various small carnivores, baboons, dune moles, snakes and tortoises,’ according to Schweitzer (1970). Another notable physical characteristic of the object is that its surface is smooth and shiny, with a few patches of crosshatching scored on the wider end, or ‘bowl’, of the spoon. From this, we are able to conclude that the bone was purposefully carved with a sharp tool, although we can only guess at what its creator’s ultimate intention might have been. The shiny surface may also indicate that this object was kept by someone and polished regularly, suggesting that the ‘spoon’ held some kind of personal importance to warrant long-term care and conservation. While there are some chips on the edges of the object, its smooth surface has little to no marks of use or areas of concentrated discolouration. 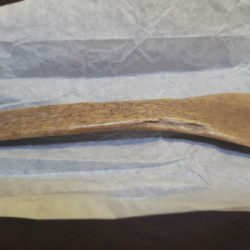 This is interesting, because a spoon that is used regularly, whether for food, painting or digging, could be expected to show some kind of staining or breakage. Given that the object is made from a relatively fragile and absorbent material, the absence of marks of use tell us that the bone may have held no utilitarian purpose at all. With these physical descriptors in mind, we return to the use of the inverted commas in the official catalogue name of this object: ‘Bone “Spoon”’. The inverted commas were intentionally left by Schweitzer and his team when cataloguing the object because of this wide margin of possibility surrounding its use. 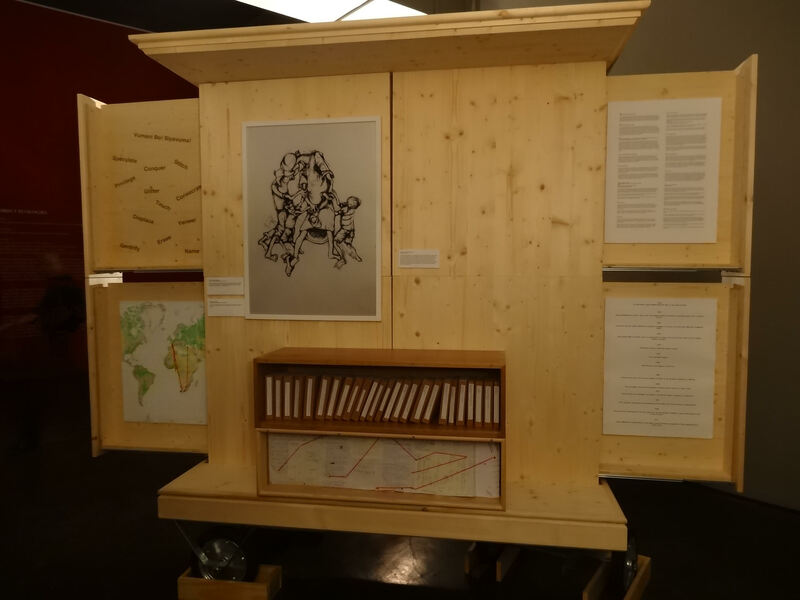 The object becomes an enigma that encourages the viewer to think about the relationship between language, classification and history. Because of the object’s age there is no way to fact-check the circumstances of its creation, and so succeeding archaeologists and collection managers have fallen on poetic guesswork to classify it. 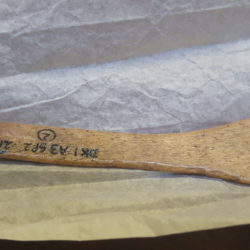 I do not intend to dispute the spoon’s labelling with strong evidence or beliefs that it was intended to perform another purpose. Instead, I wish to unpack the lack of certainty that surrounds this object and archaeological classification in general. The bone ‘spoon’ from Die Kelders site mainly brings up issues of classification and archaeological speculation. Now that it has been labelled a ‘spoon’, it is understood as a spoon and seen as a spoon, and further avenues of exploration are closed. 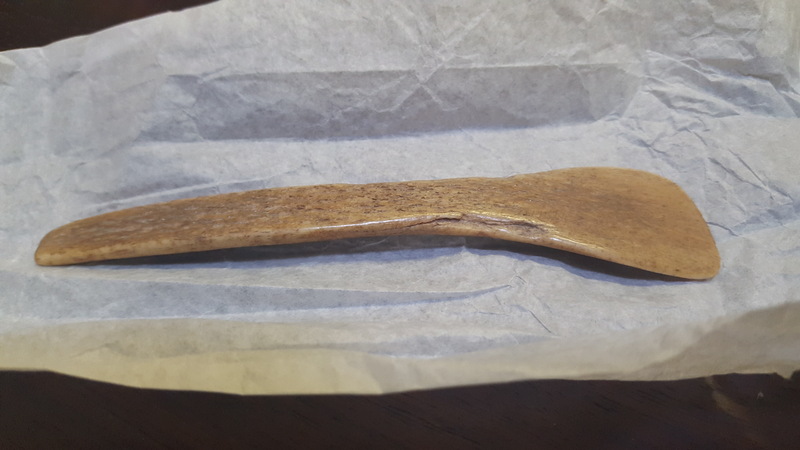 From this object, we understand two physical aspects: firstly, it was intentionally carved or etched, whether or not its maker had a clear end-goal in mind; and secondly, there appears to be no wear and tear from regular use, save that the ‘spoon’ is mildly smoothed. Interestingly, as Schweitzer labels the object a ‘spoon’, Graham Avery and his team, contemporaries of Schweitzer, write of it as a ‘spatula’ in their 1997 report on the site. While this may be a small difference, ‘spatula’ recognises the bone object as a flat, thin implement, while a ‘spoon’ is defined, according to the Merriam-Webster dictionary (online), as, ‘an eating or cooking implement consisting of a small shallow bowl with a relatively long handle’. When an object is named, we evaluate its form based on how well it performs the function we have assigned it: in this instance, the bone ‘spoon’ does not seem to be a very good spoon because of the lack of bowl and the awkward flatness and fragility of its handle. The ‘spoon’ would easily absorb ingredients or substances, deteriorating at a rapid rate, and would snap if used with heavy or thicker substances. If we measure the object by its ‘spatula-ness’, we are faced with similar problems of fragility, but as already established, its flatness makes it a good spatula. 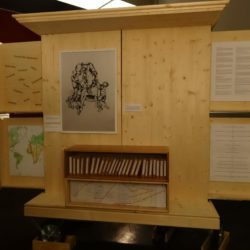 The sensibility of ‘form follows function’ is a modern one that arose around the beginning of the 20th century, and it creates a large margin for error in how we understand unknown objects. The fact that it looks like a spoon does not automatically provide evidence that it is, or should be called, a spoon. While it could very well be a spoon, my criticism is not on the logic of its specific classification, but rather of the broader critique of archaeological naming. 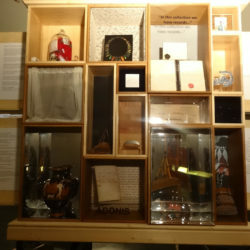 Archaeological findings are often based on the leftover and discarded materials of previous human occupation – one may very well find vital clues into what life was like in the past and what tools were used, but one might also find an animal bone, carved out of boredom and tossed aside when its creator’s attention prioritised something else. Could this be another explanation of the bone ‘spoon’? Between these polarities exist a wide spectrum of possibilities into which the ‘spoon’ can fall. 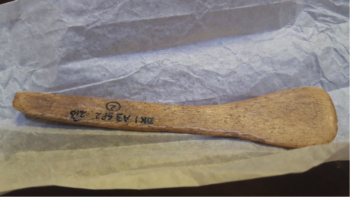 Several museum-goers were shown a picture of the bone ‘spoon’ and asked for their guesses on what the object could be, before being allowed to read the label. Many of the guests unknowingly agreed with the archaeologists and asserted that it was a spoon of some kind, but others offered more creative guesses, including a backscratcher, a crowbar, a shoehorn and an artwork – amongst other things. This object is an example of how language predetermines how we think and interact with objects around us. The inverted commas on the label of the bone ‘spoon’ guide the viewer to question the validity of the label. By placing the most significant verbal identifier in a liminal space, the archaeologist is renouncing authority over the object and claiming ‘this is only what we call it’. 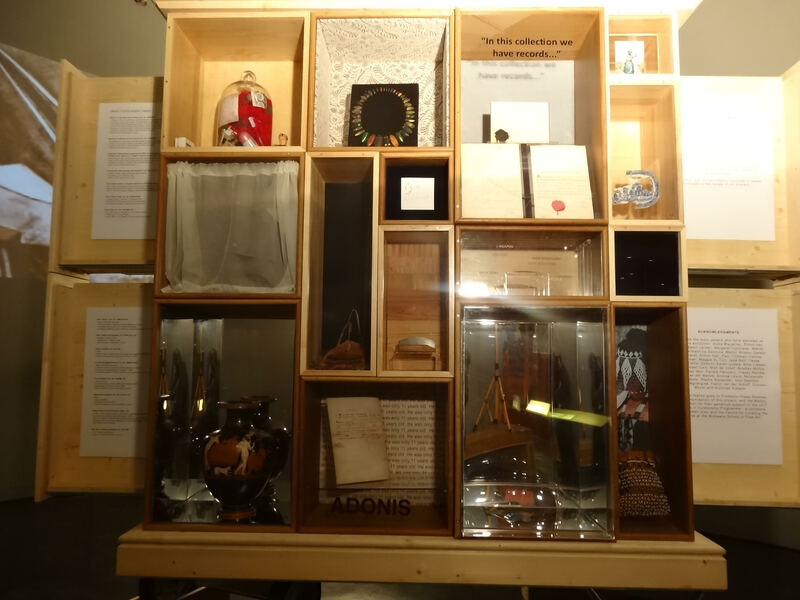 Object names, though seemingly harmless, place criteria on objects that can be used to evaluate how well it functions under that name, but also to judge in which institutions, collections and studies it should be included. Figure 1. Bone ‘Spoon’ from Die Kelders. Schweitzer, F. R. 1970. A Preliminary Report of Excavations of a Cave at Die Kelders. The South African Archaeological Bulletin 25(99): 136–138. Available: http://www.jstor.org.ezproxy.uct.ac.za/stable/3888137 [2018, October 10]. Avery, G., K. Cruz-Uribe, P. Goldberg, F. E. Grine, R. G. Klein, M. J. Lenardi, C. W. Marean, W. J. Rink et al. 1997. The 1992-1993 Excavations at the Die Kelders Middle and Later Stone Age Cave Site, South Africa. Journal of Field Archaeology 24(3): 263–291. Available: http://www.jstor.org.ezproxy.uct.ac.za/stable/530685 [2018, October 10]. Die Kelders, 18 – 518: Object was likely created in this region, and then discarded. South African Museum, 1969: Object is collected. Southern Africa, 18 – 518: Object was created, and then carried/cared for/used for a certain time period. Die Kelders, 18 – 518: Object was discarded. 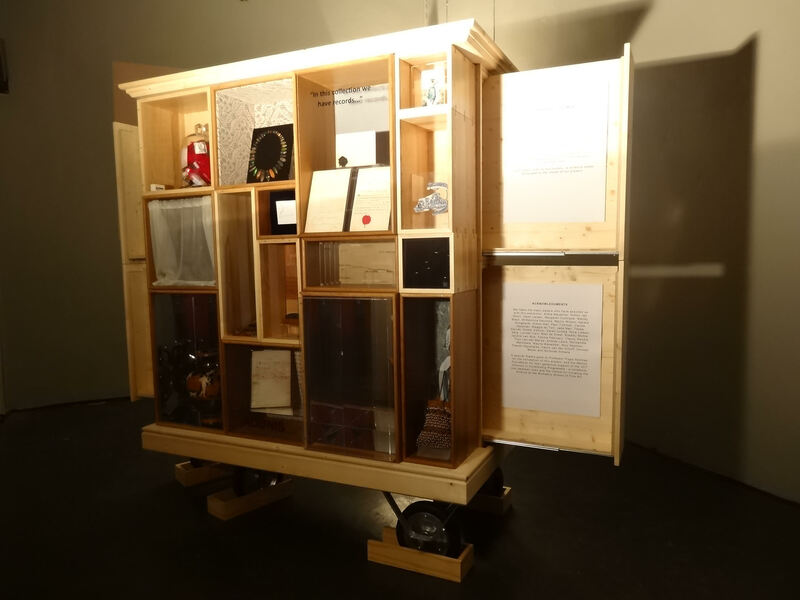 Object Ecologies, Iziko South African Museum, 3 November 2018 – March 2019. Schweitzer, F.R. 1970. A Preliminary Report of Excavations of a Cave at Die Kelders. The South African Archaeological Bulletin. 25(99):136-138. Available: http://www.jstor.org.ezproxy.uct.ac.za/stable/3888137. Avery, G., Cruz-Uribe, K., Goldberg, P., Grine, F.E., Klein, R.G., Lenardi, M.J., Marean, C.W., Rink, W.J. et al. 1997. The 1992-1993 Excavations at the Die Kelders Middle and Later Stone Age Cave Site, South Africa. Journal of Field Archaeology. 24(3):263-291. Available: http://www.jstor.org.ezproxy.uct.ac.za/stable/530685.